For exactly ten years the Heinz Maier-Leibnitz research neutron source (FRM II) of the Technische Universitaet Muenchen (TUM) has been providing research, industry and medicine with neutrons. Built to the latest safety standards, the facility enjoys such an excellent reputation worldwide that its 27 instruments are overbooked two-fold. Today the TU Muenchen celebrates the 10th anniversary with a festive ceremony in the Physics Deparment. 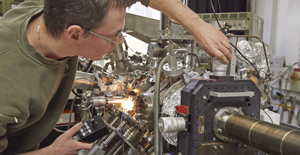 On 2 March 2004 the new research neutron source in Garching began producing neutrons. Since then, it has been among the most effective sources for neutrons worldwide. In a ceremony in the Department of Physics, the TU Muenchen is today celebrating the tenth anniversary of the facility. Alongside reputable representatives from science, former Bavarian Minister President Dr. Edmund Stoiber and Minister of Science Dr. Ludwig Spaenle will speak as guests of honor. 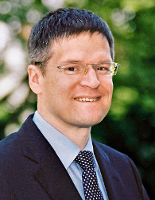 The German Federal Ministry of Education and Research is represented by Ministerial Director Dr. Karl-Eugen Huthmacher. FRM II has earned an excellent reputation around the world in the past years. Every year some 1,000 guest researchers flock to Garching to undertake measurements. 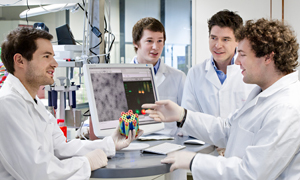 Alongside the TU Muenchen, a number of universities, institutes of the Max-Planck Society, the Research Center Jülich and the Helmholtz Centers Geesthacht and Berlin carry out experiments. Since beginning of 2013, this conglomeration goes by the name of “Heinz Maier-Leibnitz Zentrum” (MLZ). The 15 initial instruments have grown to 27 today, with five more under construction. In 2005, an industrial application center for the production of radioisotopes, primarily for medical applications, was erected to the south of the old reactor dome. In 2009 the NEPOMUC instrument – the strongest positron source in the world – was taken into operation. In 2012, the PGAA instrument broke the world record for the strongest and purest neutron beam. 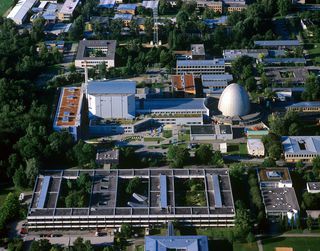 Neutron research at FRM I – the legendary “atomic egg” that went online in 1957 – formed the basis for the Garching research campus. Today, over 13,000 students and 6,000 employees study and do research on the campus. Initial plans for replacing the Garching neutron source by a new more powerful one were made as early as 1979. Construction of the new facility commenced in August 1996. It finally opened in 2004 following long and bitter political controversies. “From early on the Bavarian government actively shaped and massively supported the transition to a knowledge society. FRM II is an important element of this strategy. In retrospect, one can say: The investment was well worth it. This beacon of innovation provides important impulses for science and business, and, as such, strengthens the competitiveness of Bavaria and Germany,” said former Bavarian Minister President Dr. Edmund Stoiber during the ceremony. “The light of the neutrons grants us unique insight into the inner life of a wide variety of materials right down to the level of the atoms and molecules. The knowledge harvested here form a vital basis for the development of new technologies that will sustainably improve the lives of people,” noted TUM President Wolfgang A. Hermann. He stressed the courage of the political actors, who made it possible for the “largest infrastructure measure in the history of our university” to be realized.